To report a missing person call 000 and ask for Police. Bush Search and Rescue Victoria will only respond to an official Victoria Police request. We will normally be called only for searches in bush and mountain areas, perhaps under snow, where our members’ skills are most appropriate, rather than in urban or farming areas. As a volunteer you are not compelled to make yourself available and you should only do so if no serious inconvenience would result, if you are in good health and if your equipment is up to standard. However, you should make every reasonable effort to accept a call-out. BSAR is called out by Victoria Police because BSAR provides a source of personnel with expertise not readily available from other emergency services. Your commitment as a searcher is valuable irrespective of who is missing. It may be natural to slip into making a personal judgment about the value of attending a particular search. But the information available to you is normally very brief and may not communicate the seriousness of the situation. If a call-out occurs, you are needed. The default call-out commitment is for up to two full days of searching. Travelling to and from the search area is typically done at night by bus. If you cannot commit for two days plus travel, it is best to decline. If you are unavailable initially there may be a second call-out. Only BSAR members. A search call-out is not the time to recruit new members. Non-members are not be permitted to attend a search, no matter how willing or capable. BSAR will not be able to vouch for their claimed capabilities; extra people may upset transport arrangements; they may not be covered by the Emergency Management Act. 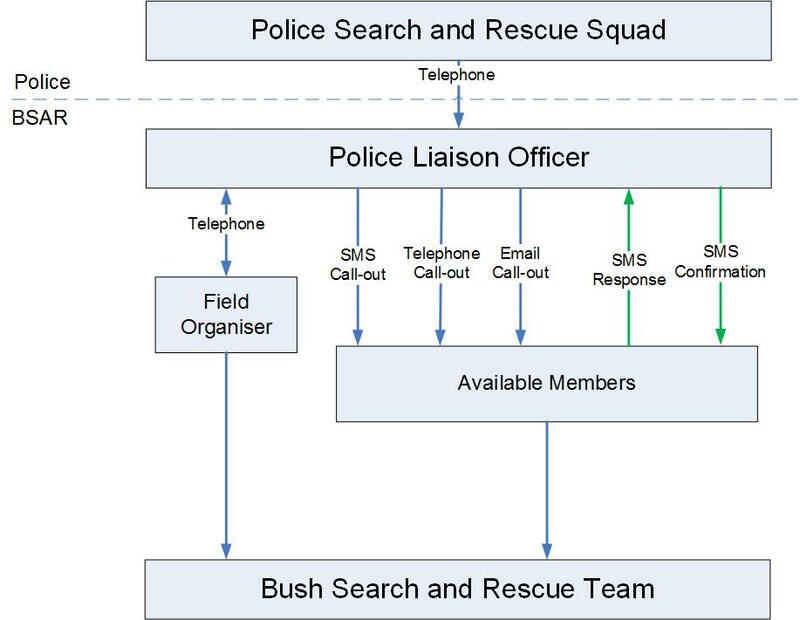 Police Search and Rescue (Police SAR) will contact a BSAR Police Liaison Officer (PLO) or Field Organiser (FO), by working down a list that we provide them. They will advise that BSAR might or will be needed. The Search PLO, with assistance from other PLOs will issue appropriate messages. Depending how likely it is that BSAR will be needed and how urgent the need, that message will be either a Standby or a Call-out. A Standby allows for preparation like speaking to your employer during the working day, or checking equipment. It will not typically include a departure time. A Call-out message will usually require immediate packing. Police SAR ideally initiate a call-out by 6pm, but more commonly it occurs in the evening or overnight. Usually a bus carrying BSAR personnel departs the same night or very early the next morning. The best time for BSAR to arrive at the search location in most circumstances is first light. Sometimes news reports may indicate that someone is lost in the bush or snow. This might provide some advance warning, but call-outs can occur at any time, often in advance of news reports. Weekends are the most likely time for trouble. It is also far more likely that call-outs will be at night rather than during the day. People are seldom reported missing before nightfall. By the time police investigate and a decision is made to call BSAR, it is usually late at night. These two factors combined mean that the period around weekends is the most likely time for a call-out with Monday nights being common. Searches are never called off due to bad weather or rough conditions. The call-out process by the Search PLO takes time. At the early stage of a search PLOs may have very little information. Do not waste time requesting unnecessary details. Concentrate on packing, times, transport arrangements and special equipment requirements. These are best written down in a notebook. Pickup location options (place and time). Do not report to the departure point without having responded to the call out. Often as little as two or three hours notice is given and if delays or difficulties have occurred you may not have sufficient time to reach the departure point. Search groups must leave at the designated time, so if you are unable to make the departure point, advise the PLO and wait for the next call-out. Call-out: Contains more information and requests a response from available searchers. Messages are automated telephone, SMS, email. Cancellation: Communicate by the SMS and email to the same recipients as the preceding Standby or Call-out messages. Automated Telephony – A recorded voice message is made to the member’s home phone or, where the member does not have a landline, their mobile. Note: The Telephone Tree method is no longer used. Detailed procedures exist for PLOs and FOs for each of these scenarios. PLOs will use the contact methods that are most suitable to the circumstances. The PLO uses automated telephony, SMS and email to all BSAR members. Searchers respond to PLO via SMS. Note thet email responses may not be read. Police SAR initiates by contacting a PLO days or weeks in advance of the search. PLO will use SMS and email for the call-out. After consultation with SAR, the FO will brief searchers in advance by email. Local Police Operations Commander initiates by contacting local BSAR club contact directly. Local Police Operations Commander notifies Police SAR of local call-out in progress. Escalation to general BSAR call-out is at the discretion of local Police Command, in consultation with Police Search and Rescue. Transport for BSAR searchers on local call-outs is preferably by local Police or SES 4WD vehicles. However, members can travel by private car if authorised by local police. Use of private cars for BSAR transport on searches is strongly discouraged. A missing person may be found ahead of BSAR’s arrival. However willingly you participate in this community service, there is no denying that every call-out is a disruption for you and to all concerned. A cancellation can be frustrating, but it is good news for the missing person(s), their family and you. .